I had two cups of coffee today while at breakfast with a friend and I’m buzzing like a bee. I don’t know how people drink this stuff regularly. I’m so amped up I can’t even get anything accomplished because I just keep spinning in circles. Laundry, dishes, prep dinner, write a blog post, take the dog for a walk. Fits and stops. I’ve gotten up three times just in the process of writing this paragraph. I need a nap. On the Needles: I’m still working on the Go Vikings socks for my nephew. And I’m trying to figure out my next project. I got some gorgeous yarn from my Tanis Yarn Club this month that I’m thinking of making into this hat. I actually made Anne’s sweater from this book and there are so many other great patterns in it I want to try as well. Reading: Tinker Tailer Soldier Spy by John Le Carre – I’m just starting to understand the story. I’ve never really delved into the world of spy novels, but from what I understand this is the holy grail. Watching: I’ve only had a chance to watch an hour so far this week and I spent it on Scandal. It was well spent. Happy St. Patrick’s Day. 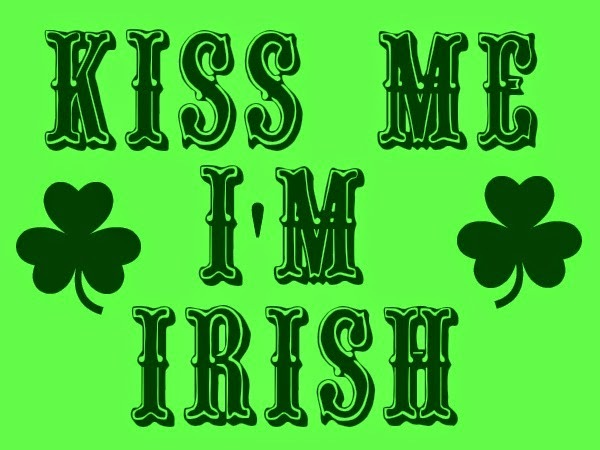 And you don’t need to kiss me, but I really am Irish.